Thanx to a promo by Softpedia, you can grab Grab Sticky Password Free (Password manager and online form filler) letting you organise and save all your passwords at same place with industry’s most powerful encryption algorithms and provides effective protection against phishing schemes, concealed key-loggers and identity theft. Each license also includes the portable version and installs easily on your USB device or flash memory stick, so you’ll always have your passwords wherever you need them. I have not tested it personally as my own personal favorite Password manager is “LastPass“, but if you are worried about storing your critical data on the cloud and want it offline, then this can be a better solution. Â· Sticky Password recognizes your password-protected sites and logs you in automatically. Â· One-click form filling! Sticky Password fills in tedious online forms quickly and accurately. Â· Sticky Password integrates with your browser and applications so your passwords and data are always ready when you need them. Â· No more lost or forgotten passwords, Sticky Password gets them right the first time and even logs you in automatically. Â· The Installation Wizard imports your passwords automatically from browsers and other password manager programs on your computer. Â· Take advantage of the automatic update feature to ensure that you always have the latest build or version of Sticky Password. Â· Sticky Password creates the strongest passwords possible and manages them for you. With Sticky Passwordâ€™s password generator, youâ€™re just a click away from another strong password. Â· The database is encrypted with the strongest encryption algorithms available in the industry, including the military-grade AES algorithm. Â· Youâ€™ll be protected from phishing scams, because Sticky Password wonâ€™t send your login and password to fake websites! Â· Multiple levels of protection against key-loggers. Sticky Passwordâ€™s automatic login and form filling ensure that there is nothing for key loggers to record. And the Virtual Keyboard also ensures that not even someone peaking over your shoulder will know what youâ€™re typing. Â· Use the new Secure Memos to store even more of your important data in the secure encrypted database. Â· Sticky Password is safer than browsers. When stored in a browser, your passwords can be used by anyone using the computer, and are also more at risk to being stolen by computer viruses than when they are securely stored in Sticky Passwordâ€™s encrypted database. Â· Sticky Password puts strong passwords under your control. Your Master Password is the only password youâ€™ll need to remember. Â· Sticky Password fills in all those online forms for you. Â· No toolbars required: located in the title bar, the Caption Button is your access point to Sticky Password functions. No one else has it. Â· Each Sticky Password license includes the Sticky Password Portable Version, so youâ€™ll always have your passwords when you need them. Â· Sticky Passwords supports secure export and other collaboration options. Â· Your password Accounts will be organized the way you want with our enhanced groups. Â· Keep your passwords and data in synch! Easy synchronization between your PC and Portable versions. Â· Support for the browsers you use. 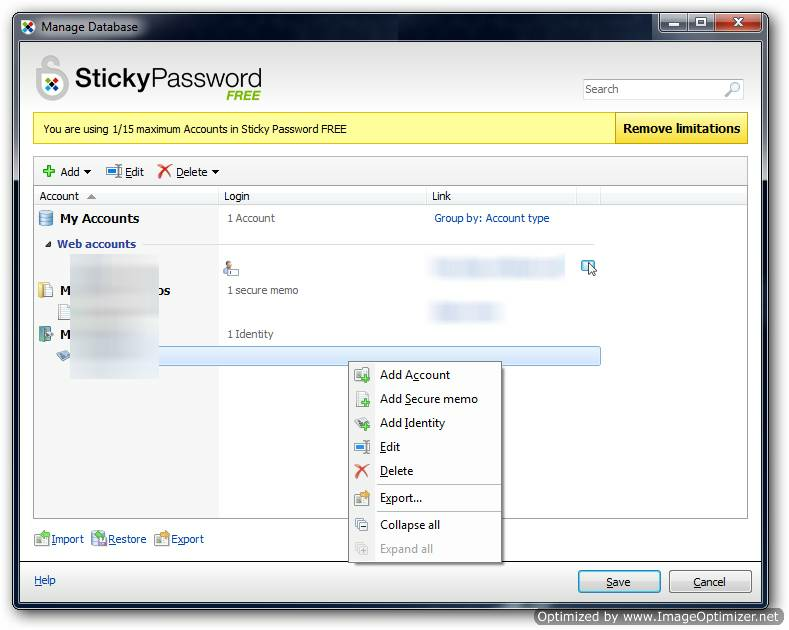 Sticky Password works with Internet Explorer, Firefox, Google Chrome and more, so youâ€™re not tied to any single browser. To grab the free license and download Sticky password, visit this promo page from Softpedia. PS: Thanks Ashwin for the tip. Sticky Password Free is only for 15 passwords and is offered on their download site, so why is a license needed? Please clarify. whether this is a license for the FREE or PRO version. The PRO allows for more passwords. This version is a softpedia exclusive.